Click the map to enlarge it (and again if necessary). 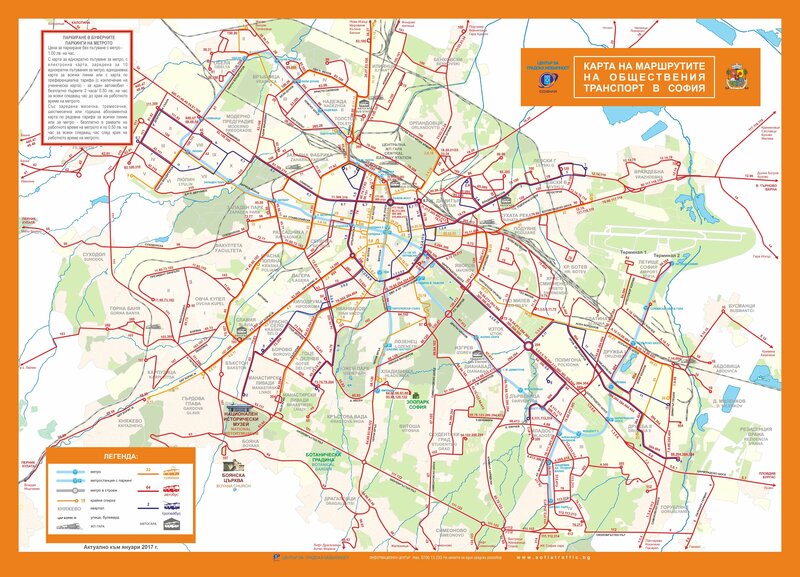 You’ll see from the map that Sofia Airport (on the right side of the map) is connected to the city by bus and by metro from terminal 2. If your flight arrives at terminal 1, there’s a free shuttle service between the terminals. The metro from terminal 2 is the faster option to the city centre. Tickets are cheap and valid for the entire metro network. Get them from the station cashier desks or ticket machines. There are plenty of taxis too in front of both terminals, but be sure to agree the price before getting into one. Rogue drivers may charge up to five times the regular price. Book ahead to avoid the hassle. Accommodation, food, eating out, and even world-class opera are all wonderfully cheap compared to more western capitals. But affordability is just the icing on the cake. Sofia is a city of exceptional charm and interest, and comparatively undiscovered by mass tourism. It’s a pleasantly laid-back place, with friendly people, a 2000-year-old history, terrific scenery within easy reach, and buzzing café culture and nightlife. Culturally, historically and visually, it’s a fascinating mixture from past eras, with green and gold onion-domed churches, Ottoman mosques, cobbled streets, elderly trams (and some much more modern ones), and old communist-era buildings and monuments. And if you tire of city bustle, there are huge green parks. In winter, the ski slopes of Mount Vitosha are just a short bus ride from the centre. In summer, the mountain offers great hiking trails with views over the city and beyond. Catch bus line 122 or 123 to the Simeonovo cable car lift that takes you up the mountain, get off at the Aleko Hut station for a trek to Mt Vitosha’s highest peak, Cherni Vrâh (literally ‘Black Peak’). The Cyrillic script is the writing system used in Russia, Eastern Europe and central Asia. Sofia’s main streets and major tourist attractions use both Cyrillic and Roman letters, but other streets and signs don’t. So life is much easier if you’ve taken a little time to learn the letters. Learn the Cyrillic alphabet and you’ll be able to read the names of any street, also shops and restaurants, find your way around bus and railway stations and understand notices and timetables – and impress your companions!